The Last Princess (Hangul: 덕혜옹주; Hanja: 德惠翁主; RR: Deokhye-ongju; lit. Princess Deokhye) is a 2016 South Korean period drama film directed by Hur Jin-ho with a screenplay by Hur, Lee Han-eol, and Seo Yoo-min, based on the best-selling novel by Kwon Bi-young. It stars Son Ye-jin as Princess Deokhye, the last princess of the Joseon Dynasty. The film depicts Princess Deokhye's life in Japan after she was forced to move there at age 13 by the Imperial Japanese government, and her attempts to return to Korea. In 1925, Korea is ruled by Japan, and 13-year-old Princess Deokhye – the last princess of the Joseon Dynasty – is forced to move to Japan to attend school there. She misses her home, and after she finishes school she makes several attempts to return, but is prevented by pro-Japanese general Han Taek-soo. One day, she is reunited with her childhood friend, Kim Jang-han, an officer in the Japanese army who is also part of the Korean independence movement. Kim plans a secret operation to move Deokhye and her brother Yi Un to Shanghai, site of the Provisional Government of the Republic of Korea. This attempt fails after Han Taek-soo discovers the plan, and Deokhye and Kim are separated, losing contact with each other. She is forced to marry Count Takeyuki So in 1931, and develops schizophrenia after giving birth to their daughter the following year. Kim becomes a newspaper reporter and eventually finds Deokhye in a Japanese mental hospital, decades after they were separated. He then persuades the South Korean government to allow her in the country, and in 1962, Deokhye is finally able to return to her homeland. Director Hur Jin-ho decided to make a film about Princess Deokhye after watching a documentary about her on television; he could not forget the scene showing the princess reuniting with her court ladies at the Gimpo Airport, when she was finally allowed to return to Korea after 38 years in Japan. The film's screenplay was co-written by Hur, Lee Han-eol, and Seo Yoo-min, based on the best-selling novel Princess Deokhye (2009) by Kwon Bi-young. The story is a mix of fact and fiction, as Kim Jang-han is a fictional character. Princess Deokhye's story had never been made into a film before this. At the 2012 Busan International Film Festival (BIFF), Hur's film project was selected to receive co-production development support from the Korean Film Council. Pre-production for The Last Princess began in 2014. In August 2015, Son Ye-jin and Park Hae-il were announced to be starring in the film. Son had previously worked with Hur on the 2005 film April Snow. The Last Princess was launched in October 2015 at BIFF's Asian Film Market. Principal photography commenced on 30 November and was completed on 23 March 2016, with filming taking place in Japan and South Korea. The film was initially funded with US$8.6 million, and Son invested ₩1 billion (US$886,500) into the film after production costs rose, so the staff would have a "more comfortable working environment". Son accepted the role of Princess Deokhye with no hesitation. In an interview, she said "I know how hard it is to find a film that places such importance on a female character and deals with her life's journey...I have no hope that I'll come across another film like this for the rest of my career." However, she felt "tremendous pressure" portraying a historical figure, and it was her first time playing such a role. At a press conference, she said of the role: "The most difficult part about acting out Princess Deokhye was to think over and over what the princess would have done whenever I was confronted with the discrepancy between the existing archives and the film-adaptation version." After seeing the completed film, she said she had no regrets about her performance. The Last Princess opened in third place at the box office on August 3, and rose to the number one spot during the weekend of August 5–7. Over the weekend, 1.2 million tickets were sold across 961 screens, accounting for 24 percent of all ticket sales in South Korea. The film earned US$12.4 million in a five-day period (August 3–7), with 1.7 million tickets sold. The film grossed US$35.4 million in South Korea. It grossed US$40.35 million worldwide. The film received generally positive reviews by critics. Sung So-young of the Korea JoongAng Daily praised the film for being "interesting enough to hold the audience's interest from beginning to end", even though she felt Hur's imagination went too far in several scenes. She said major events from Princess Deokhye's life were portrayed well, and the film's biggest virtue was how it made audiences want to know more about her. Woo Jae-yeon, writing for Yonhap, said the film confirms Hur's reputation as a director who "has a proven track record in weaving a love story from a delicate web of emotions that each character experiences". Woo also praised Son Ye-jin's "outstanding" performance for her portrayal of "the unfathomable depths of the emotional ups and downs of Deokhye." Rumy Doo of The Korea Herald said the film was a "refreshing change from typical dramas about the Japanese occupation of Korea, which are usually intent on delivering a message of patriotism, and tend to be heavy-handed in their emotional arcs". Doo appreciated Hur's "muted approach" in his handling of the character's emotions, and praised the performances of the two leads, saying Park Hae-il showed "deft skill and subtlety" and Son Ye-jin proved herself a "sensitive and technically refined performer". 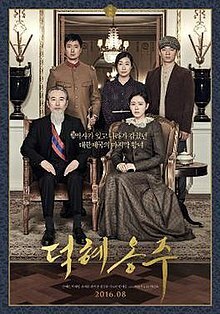 Yun Suh-young of The Korea Times praised the film for being "engaging, entertaining and moving", rare for a historical film, and complemented Hur's "masterful" direction and the cast's "superb" acting. ^ a b "The Last Princess (2016)". The Numbers. Retrieved 30 December 2016. ^ a b c Woo Jae-yeon (29 July 2016). "(Movie Review) Life is swept away in historical turmoil in 'The Last Princess'". Yonhap News Agency. Retrieved 29 July 2016. ^ Lee Ji-hae (30 June 2016). "Son to portray Korea's last princess". K-Pop Herald. Retrieved 29 July 2016. ^ Sung So-young (5 August 2016). "Hur Jin-ho talks finding muse other than heartbreak: Director says life of the 'Last Princess' was too emotional not to tell". Korea JoongAng Daily. Retrieved 5 August 2016. ^ a b c Yun Suh-young (2 August 2016). "Tragic life of Korea's last princess on screen". The Korea Times. Retrieved 2 August 2016. ^ a b Sung So-young (29 July 2016). "Korea's 'Last Princess' comes alive in new film". Korea JoongAng Daily. Retrieved 29 July 2016. ^ a b Doo, Rumy (3 August 2016). "'Last Princess' is career-defining film, says actress Son Ye-jin". K-Pop Herald. Retrieved 6 August 2016. ^ Conran, Pierce (27 August 2015). "Son Ye-jin to Play Hur Jin-ho's The Last Princess". KoBiz. Retrieved 29 July 2016. ^ Kil, Sonia (14 March 2016). "FilMart: Lotte Launches Kim Han-min's 'The Hunt'". Variety. Retrieved 30 July 2016. ^ Conran, Pierce (6 April 2016). "Son Ye-jin Wraps Colonial Era Drama 'The Last Princess'". KoBiz. Korean Film Council. Retrieved 6 August 2016. ^ Park Sae-jin (19 November 2015). "Son Ye-jin to return to screen as 'Princess Deokhye'". Aju Business Daily. Retrieved 6 August 2016. ^ a b c Woo Jae-yeon; Koo Jung-mo (29 July 2016). "(Yonhap Interview) Son Ye-jin says she gave her all as Princess Deokhye". Yonhap News Agency. Retrieved 29 July 2016. ^ "Actress Son Ye-jin reveals difficulties in playing historical figure". Yonhap News Agency. 29 June 2016. Retrieved 29 July 2016. ^ Sung So-youn (9 August 2016). "Korean films top the local box office: 'Princess' and 'Chromite' lead way; 'Busan' sells 10M tickets". Korea JoongAng Daily. Retrieved 9 August 2016. ^ "'The Last Princess' dethrones 'Operation Chromite' at box office". Yonhap News Agency. 8 August 2016. Retrieved 9 August 2016. ^ Kil, Sonia (7 August 2016). "Korea Box Office: 'Princess' Reigns Over Weekend, 'Squad' Opens Third". Variety. Retrieved 9 August 2016. ^ "The Last Princess (2016)". KoBiz. Korean Film Council. Retrieved 29 July 2016. ^ Doo, Rumy (31 July 2016). "[Herald Review] 'The Last Princess' a refreshing historical drama". The Korea Herald. Retrieved 2 August 2016. ^ "Hollywood Local Productions Dominate Nominations for South Korea's Blue Dragon Awards". The Hollywood Reporter. Retrieved 19 November 2016. This page was last edited on 13 April 2019, at 01:45 (UTC).